(Nanowerk News) Understanding the steps to the intricate dance inside a cell is essential to one day choreographing the show. By studying the molecules that give a cell its structure, University of Illinois researchers are moving closer to understanding one of those steps: the conga line. Researchers at the University of Illinois found that actin filaments (red) move in a path (blue) with an irregular diameter, instead of a cylinder as widely accepted. Led by Steve Granick, Founder Professor of Engineering and professor of materials science and engineering, of chemistry, of chemical and biomolecular engineering, and of physics at the U. of I., the team will publish its findings in the journal Physical Review Letters. Long chains of the molecule actin form filaments that are a key component of the matrix that give cells structure. They play a role in numerous cellular processes, including signaling and transport. Similar polymers are used in applications from tires to contact lenses to the gels used for DNA and protein analyses. Long actin filaments display snakelike movement, but their serpentine wriggling is limited by crowding from other filaments in the matrix. Researchers have long assumed that actin filaments could move anywhere within a confined cylinder of space, like a snake slithering through a pipe. However, Granick and his research group have created a new model showing that the filaments’ track isn’t a perfect cylinder after all. 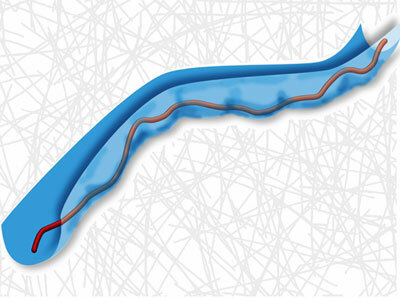 Rather than a snake in a pipe, a filament moves more like a conga line on a crowded dance floor: Sometimes it’s a tight squeeze. To track the filaments’ motion, the Illinois team used a novel approach. In the past researchers have observed the entire large molecule, which was like trying to figure out a conga line’s trajectory by watching the entire crowd writhing on the dance floor. Granick and his team tagged a few individual links in the molecular chain with a tiny fluorescent dye and monitored how those moved as the filament slithered along. In the conga line analogy, this approach would be like giving neon shirts to a few people at various points in the line, turning on black lights, and tracking the neon-clad dancers’ motion to map out the conga line’s path around the floor. Next, the team will focus on further improving their model to include a molecule’s forward motion as well as its lateral wiggling. “So far we’ve been able to see the conga line bending, moving sideways, and now we want to see it move in the direction it’s pointing,” Granick said.